Memorial Day Weekend kicks off a full season of patriotic decorating opportunities for your home. After Memorial Day there is Flag Day (6/14) and of course, July 4th which are great opportunities to decorate with some red, white and blue. I have rounded up some of my favorite decor ideas below. Make patriotic utensil holders by placing garland inside of mason jars. Have you ever dyed rice? It’s surprisingly easy and the results are pretty awesome looking! We made these red, white and blue layered centerpieces with dice that we dyed. Love the look of this patriotic bandana wreath from The Country Chic Cottage. Pick up some bandanas here. Add some blue food coloring to water in a mason jar. Add daisies and a small American flag for a lovely patriotic centerpiece! Paint some stars on your lawn. You could try a washable chalk spray paint that will wash away after the next rain (or spray it off with a hose). Inspiration from Practically Functional. This is fun! Make a wreath… out of Solo Cups! Inspiration from Tell It To Your Neighbor. If you have bandanas left over from the wreath project above, use them to make a patriotic table runner! This example is from Matt and Shari. Print out these free patriotic photo props and tape them to sticks. Place them in a mason jar to not only add some holiday decoration to your home, but they add a lot of fun to parties and BBQs! Another centerpiece idea – fresh sunflowers with an American flag. Love these American Flag Mason Jars from maison de pax. How simple, yet how pretty! 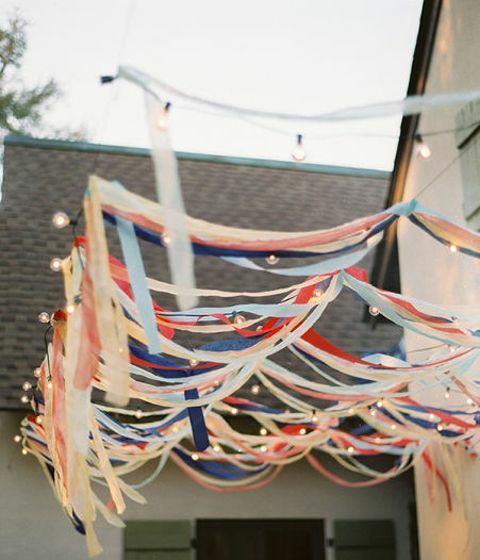 Use streamers and lights to create this pretty look from Liz Marie Blog. Use red, white and blue solar powered hanging lanterns to decorate outdoor spaces. They are so pretty during the day and then look awesome all lit up at night.